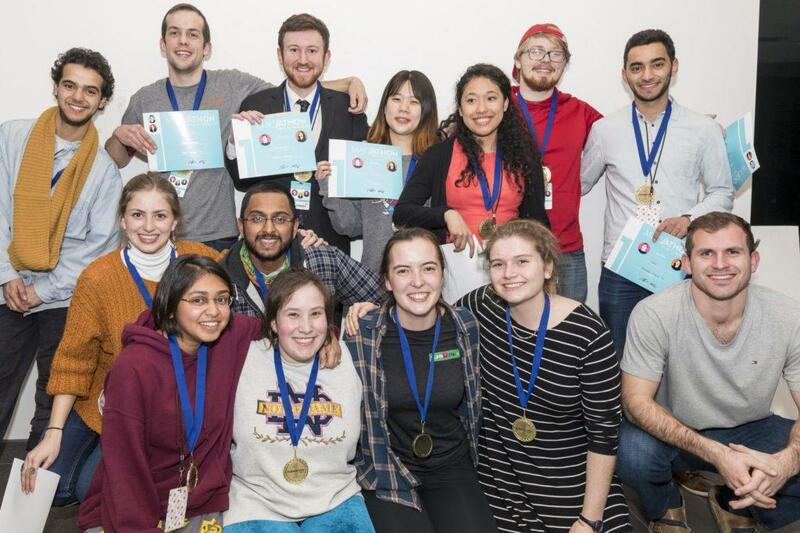 Members of Macathon teams “7bibi” and “Cobenesoka” and the Funkathon team “Moonbinch and the Belligerent Earth Girls” gather following their respective wins on Saturday night. Photo courtesy of Macalester College. One hundred fifty-four Macalester students on 33 teams participated in the 24-hour Macathon and Funkathon competitions from Friday, Feb. 24 to Saturday, Feb. 25. 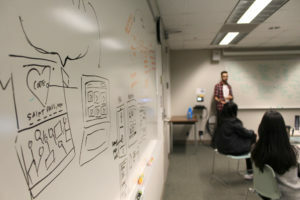 In its fifth year, Macathon — a combination hackathon and business pitch contest — tasked teams with designing a product or service that addresses a significant business or social problem. Teams competing in Funkathon, now in its second year, created and recorded an original musical piece under four minutes long. Judges for each competition were Macalester alumni who have been successful in business, technology, music or art. Macathon teams had a variety of approaches to creating and pitching their ideas. Some teams, including Cobenesoka (comprised of members Ned Read ’17, Kassandra Munguia ’18, Connor Valenti ’17, Ben Mathers ’17 and Sojin Oh ’19), began the competition on Friday with a clear plan in mind. “We’re working to make an app that accurately sends your location to 911 dispatch centers,” Read said on Friday afternoon, just over one hour into the competition. Other teams, like 7bibi (whose members include Forest Redlin ’17, Ari Hymoff ’17, Farah AlHaddad ’17, Mutaz Alnaas ’17, Prady Bansal ’17 and Muath Ibaid ’17) discussed different project ideas even as Macathon began. 7bibi ultimately settled on creating a prototype needle exchange box aimed at providing clean needles to injection drug users to reduce the spread of HIV and Hepatitis C.
Despite such differing approaches and products, Cobenesoka and 7bibi tied for first place, each receiving a $1,000 prize. This was the first time two Macathon teams have tied for the top prize. Macalester’s Entrepreneur in Residence Kate Ryan Reiling ’00, an administrative coordinator of both Macathon and Funkathon, noted the ways in which this year’s Macathon stood out from those in years past. “Every year [Macathon] has great energy, but I think this year there was an awesome feeling of students being curious of what other students were doing,” Ryan Reiling said. Ryan Reiling felt that the Funkathon teams were particularly successful in their musical endeavors. “I always love listening to the Funkathon recording and presentations — there is such beauty in what they are able to create in 24 hours,” Ryan Reiling said. Funkathon participants, including Yuri Smith ’18, enjoyed the challenge of focusing on a musical project for 24 consecutive hours.